Today, Electronic Arts and the NFL announced the launch of the Madden NFL Club Championship, an esports event that involves all 32 of the NFL’s teams. The competition, which will be part of this year’s Madden NFL Championship Series, starts on August 22, which is the game’s preorder release day. Starting today, would-be competitors can sign up to represent their NFL team of choice. Once players sign up, championship organizers will select the best players based on their performance in online competition. 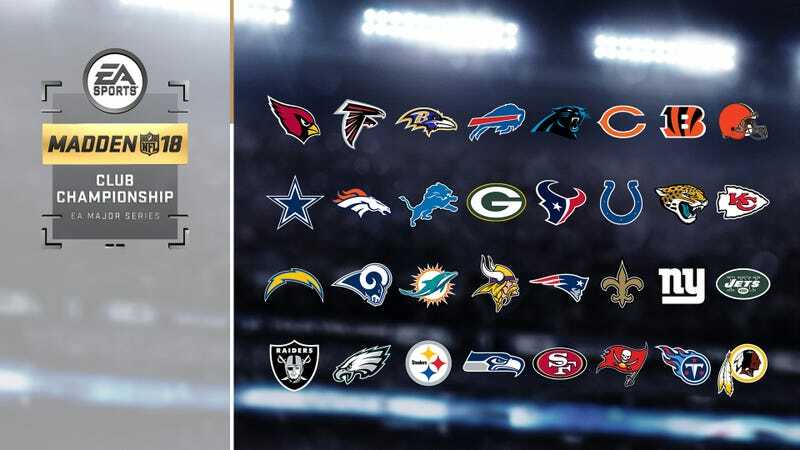 Each of the 32 NFL teams will select one Madden player to represent them in championship events. These 32 finalists will face off in the finals from January 26 to February 2, 2018. The involvement of all 32 NFL clubs is a first when it comes to sports league presence in esports. By comparison, 17 NBA teams partnered with Take-Two Interactive earlier this year to form the inaugural NBA 2K league. One difference is that the NBA 2K league will organize an esports pro draft, whereas the Madden NFL Club Championship allows anyone to qualify for a slot via online competition. When Madden players sign up via the championship website, they must choose a football team. If you want to up your statistical chance of ending up in the finals, try to guess which team might be least popular.